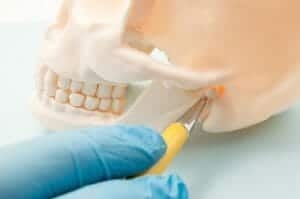 If you frequently wake up with pain or stiffness in your jaw, or hear clicking or popping noises when you open or close your mouth, you could have a problem with your temporomandibular joint (a.k.a., your “TMJ”). The TMJ joins your lower jawbone to your skull. Sometimes the joint, the nerves and muscles that control jaw movement can develop a TMJ disorder (or TMD), a collection of problems that cause pain and discomfort. The National Institutes of Health estimate that over 10 million Americans are affected with TMJ disorders. Below, Dr. Raymond Hatland discusses what you should understand about TMJ disorders and how he can provide relief from related pain and discomfort. You can locate your TMJ by placing your fingers in front of your ears and opening your mouth. The TMJ is one of the most versatile joints in the body. It allows you to move your jaw up and down as well as side to side. Its position and movement are controlled by muscles attached to it and the body of the mandible. The portions of the bones that interact with the joint are covered in cartilage. A small disc separates the bones, cushioning the forces on the joint and enabling the jaw to move freely and properly. What Causes Problems with the TMJ? There are a few things that can cause problems with the TMJ. Arthritis can damage the jaw joint’s cartilage, or the small disc can erode or slip out of alignment. A sudden blow or injury can damage the joint However THE most common cause of TMD is the chronic microtrauma of stress energized oral habits such as prolonged clenching and/or night-time bruxing (grinding). These habits can start in childhood and episodic exacerbations can occur over the years as stress levels rise and fall. Lifestyle, diet, and nutrition can also play a role. The particular occlusal relationship of your teeth (ie. your bite) can be a major aggravating factor. Dr. Hatland can provide much-needed pain relief if you are struggling with the symptoms of TMD. He uses an intraoral appliance that gently relaxes the maxillofacial muscles. When worn over the teeth at night, the appliance gives you “the perfect bite” and reduces and shuts down your body’s desire to clench or grind. Dr. Hatland can combine the use of the appliance with energy work to help you see results faster. By relying on a holistic approach, you will notice your health improves on several levels, and you may sleep better, chew easier and experience real relief from pain and tension. If you are experiencing uncomfortable symptoms consistent with TMJ disorder, you should be evaluated by Dr. Hatland. Please call or email our practice to schedule an appointment at our Chicago or Indianapolis offices today.